While Brooke Henderson insists life hasn't changed since bursting onto the golf scene, her game continues to grow, inching closer and closer to some of the all-time Canadian greats. "That was just kind of different, but kind of cool," said Henderson with a laugh from Naples, Fla., as she prepared for the LPGA season-opening Diamond Resorts Tournament of Champions this week in Lake Buena Vista, Fla. 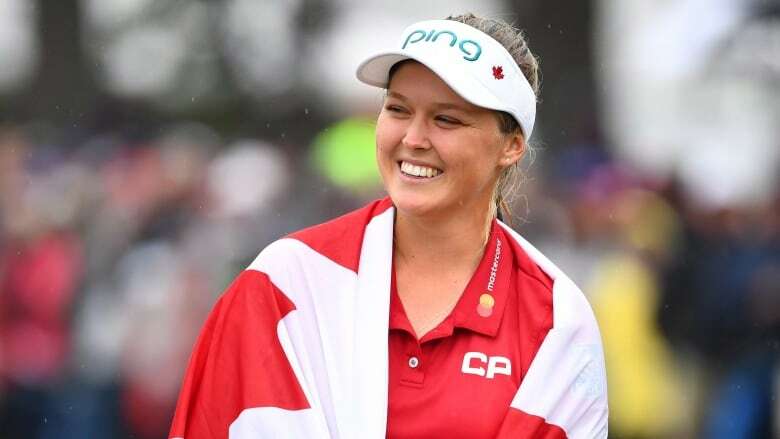 While the 21-year-old native of Smiths Falls, Ont., insists life hasn't changed much as she's rocketed up the golf rankings the past few years, the airplane scene shows just how far Henderson has come in the general Canadian sport landscape. To match or eclipse that mark, the reigning Canadian Press female athlete of the year (an award she has won three times in the past four years) said she's focused on keeping her scoring average below 70. Her 2018 average of 69.99 was good enough for fourth on tour and if she meets that goal again, she said everything else would fall in line. The key to her success will be her putting, as it's the one area of her game that has held her back in the past. She said she's been working hard with her father Dave (who is also her coach) on speed. Having good pace on the greens, she said, would be a difference-maker this year. "I've been working on consistency and make sure I'm ready for 2019," she said. "And I feel like I am." Henderson earned a legion of new fans at least year's CP Women's Open in Regina, when she won by four shots and became the first Canadian woman to win on home soil in 45 years. She also won the Lotte Championship in Hawaii in April. "I feel like I'll be in contention a lot of the time and hopefully that leads to getting at least one win this year," said Henderson. "But I'd love to keep that streak going of having at least two (she's won two tournaments each of the past three years)." Adam Hadwin, Canada's top-ranked male golfer, certainly wouldn't doubt that possibility. He calls Henderson "a force." "With someone like her, with her being so young, the world is her oyster," said Hadwin. "My hope is that she continues to enjoy the game and she stays the young, happy kid that she is and she continues doing what she's doing. If she can do that, she'll have an extremely long, successful career." Despite the money (she's earned more than $1.4 million US the last three years in a row and counts Rolex as one of her sponsors), and the fame (a bobblehead doll made in her likeness has become a collector's item), Henderson doesn't feel like her life is that much different. It's been a big adjustment going from a town of 9,000 to being recognized around the world, she admitted, but Henderson remains close to the people who have been by her side for years. After dropping the ceremonial puck before an Ottawa Senators game in December and receiving a standing ovation, she watched the game in a box surrounded only by family and some friends she's known since grade school. "The people that have always been there for me and always been important to me haven't changed at all," she said. "I feel like I've just grown friends around the world. I've brought things in, in addition to those people from my life in Smiths Falls." Henderson, who joked at the 2017 CP Women's Open about retiring early, said she's not looking too far ahead these days. "I feel like I've handled everything pretty well so far," said Henderson. "I'm just trying to get a little bit better every day, and have a great year."